From monkey business to monkey fossils, monkeys hold a prominent place in humor as well as in scholarly research. STEM Café’s January presentation will explore the ways that our primate cousins offer keys to understanding the development of human life. The talk will take place from 6:30 to 8:30 PM at Eduardo’s Restaurant, 214 E. Lincoln Hwy. in DeKalb. This month’s speaker is Illinois Professor of the Year Dan Gebo. 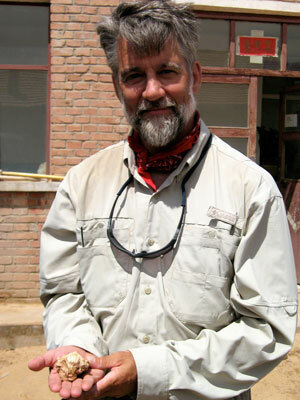 A world-renowned primate comparative anatomist and paleontologist, Gebo holds a Board of Trustees Professorship at NIU. He has traveled the globe studying living and extinct primates to understand the diversity of life and the progress of primate and human evolution. Gebo hopes participants will come away from this STEM Café with a better understanding of the history of life itself. “Fossil primates that are closely related to humans are interesting animals that can tell us a lot about our past. Their size and diversity are quite surprising,” he says. He plans to share a collection of fossil casts that illustrate major evolutionary events and show how primates have adapted to changing environments. This talk is part of NIU STEM Outreach’s popular monthly STEM Cafés, which invite people to meet at restaurants throughout the area to eat, drink and have lively discussions about the latest innovations in science, technology, engineering and math. STEM Cafés are free and open to the public. Food and drinks will be available for purchase from Eduardo’s. For more information about this and other upcoming STEM Outreach programs, email jdymond@niu.edu.